Make your own beautiful Feather and Fan Crochet Blanket. 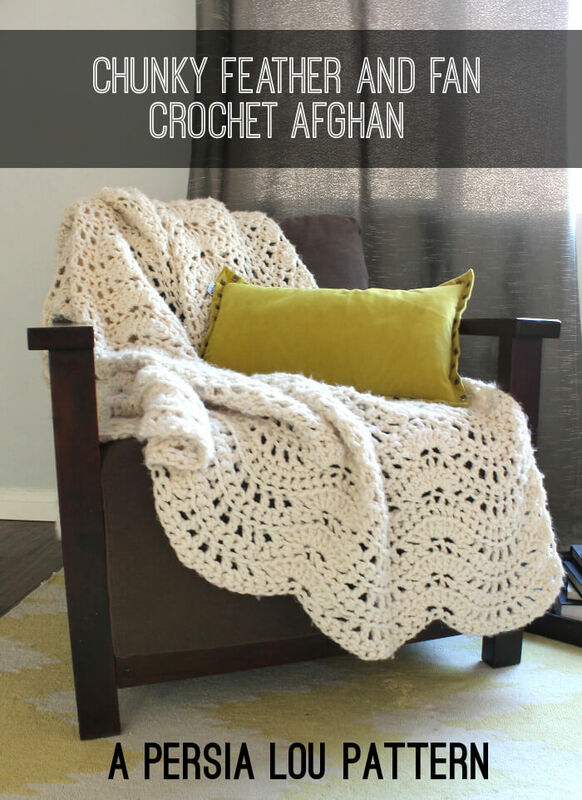 This free chunky afghan pattern works up quickly and has lots of great texture. This post contains affiliate links for your convenience. See my full disclosure policy here. One day I hope that I can really figure knitting out. I’ve tried a few times, but it seems that my fingers just don’t really work that way. I always end up going back to my trusty hook. But sometimes when I really love the look of a knit object or technique, I try to create a crochet version. 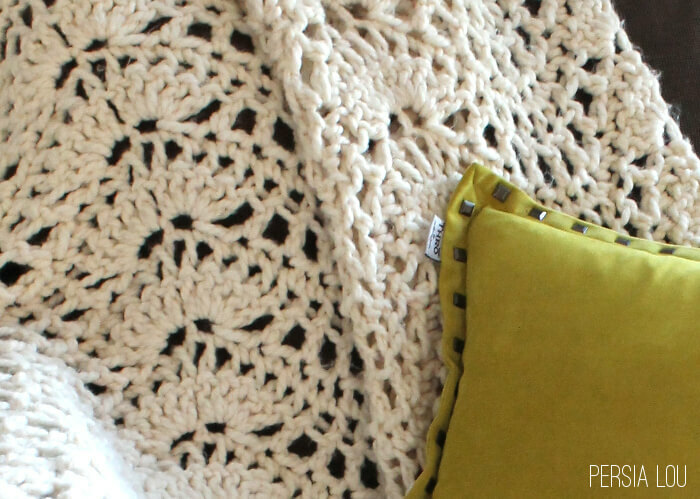 Once upon a time a saw a knit throw made using a lace stitch called the feather and fan. I LOVED it. So much that I even pulled out my needles. But like I said, these dumb fingers. Anyway, I picked up the biggest hook I could find and some super bulky yarn and put together a crochet version. This little throw was a Christmas gift for my mother a couple of years ago when I wasn’t blogging much. Every time I see it at my mom’s place, I think that I really like it and that I need to make one for myself. So I’m sharing the pattern with you all now in case you feel the same way. Since this afghan uses a super bulky weight yarn and a huge hook (I mean, it looks a bit ridiculous honestly), it works up pretty quickly. 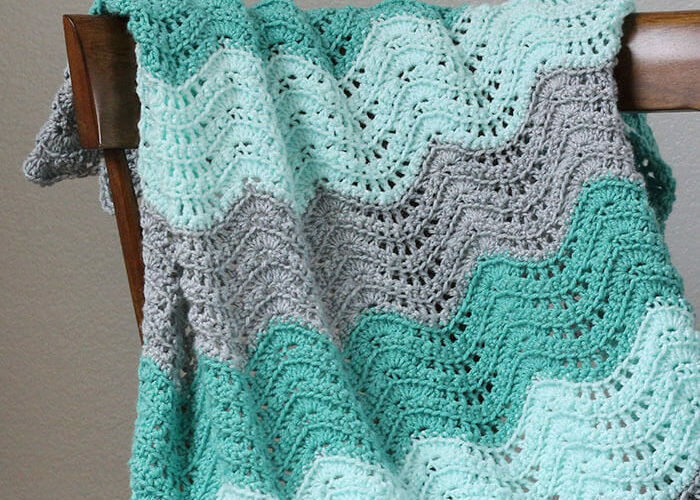 My Feather and Fan Crochet Blanket pattern is free for personal use. You may sell items that you make from the pattern as long as you include a link back to the pattern when possible. Please do not sell or redistribute the pattern in anyway. If you want to share the pattern with a friend, please just send them a link. 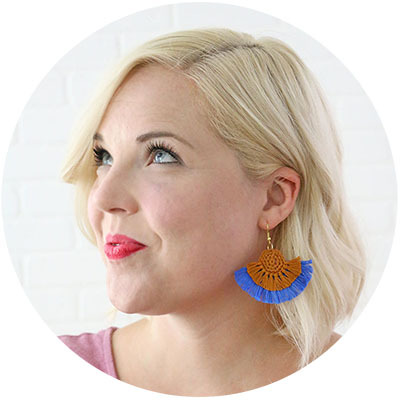 Pageviews provide me with income that allow me to offer my patterns free of charge. Thank you for your support! Row 1: 85 fsc (foundation single crochet) [Read about how and when to use fsc here. You can also ch 86, sc in second ch from hook, sc in each remaining ch to make 85 sc; however, I really recommend learning fsc.] Turn. Row 3: Ch 1, working in front loops only, sc in each st across (85). Turn. Repeat rows 2-3 until afghan reaches desired length. Finish off. Weave in ends. UPDATE 3/26/14: Because people seem to be struggling a bit with the written instructions for Row 2, I have made a chart to help you visualize how the pattern works. You can find a key for interpreting crochet chart symbols here. My chart-making skills are far from professional, but hopefully it will still be helpful. 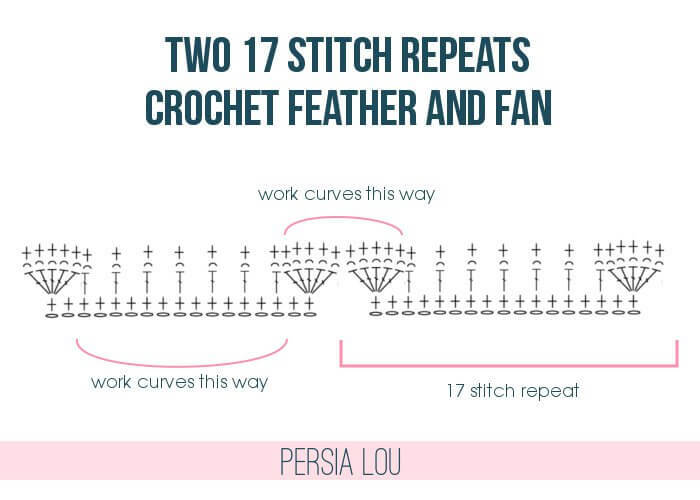 The chart depicts the stitches in a straight row, but in actuality the work curves into a scalloped shape – when you skip stitches, the bottom of the work will curve out as the top pulls together and when you work clusters, the top of the work will curve out to accommodate the extra stitches. I tried to indicate this with my pink curved lines below, but you will probably have to use your imagination a bit. As you can see, the pattern is worked in 17-stitch repeats. The pattern calls for 85 stitches, which is five repeats. You could add or subtract multiples of 17 to adjust the width of your afghan. Hope that’s a bit clearer for those of you who were struggling with the written instructions. UPDATE 2/5/16: I just finished a video that walks you through how to make the feather and fan stitch! YAY! Check out the video right HERE, and I would love if you subscribed to my Youtube Channel HERE. 🙂 Thanks! 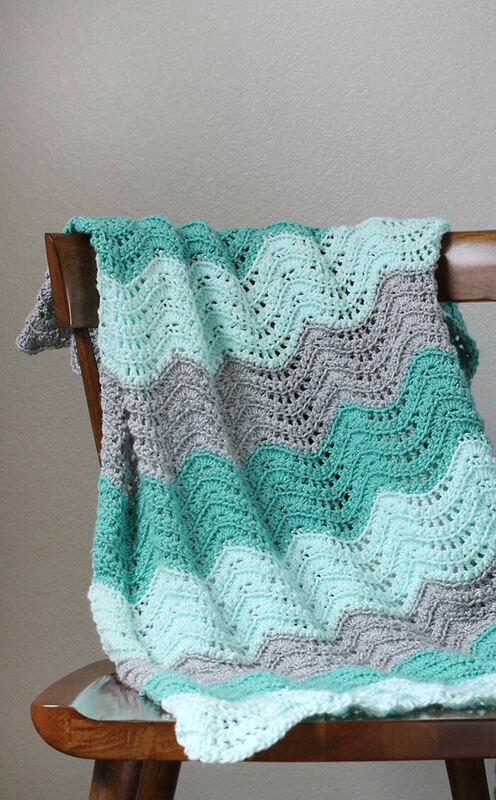 If you make your own Feather and Fan Crochet Blanket, I would love to see it! Share your photos to my facebook page or tag me on instagram or twitter (@persialou), and don’t forget to use the hashtag #persialou for a chance to be featured. This looks like the most comfortable, warm, cozy blanket ever! I can&#39;t imagine having the skills to make something so beautiful. Well done. So cozy! 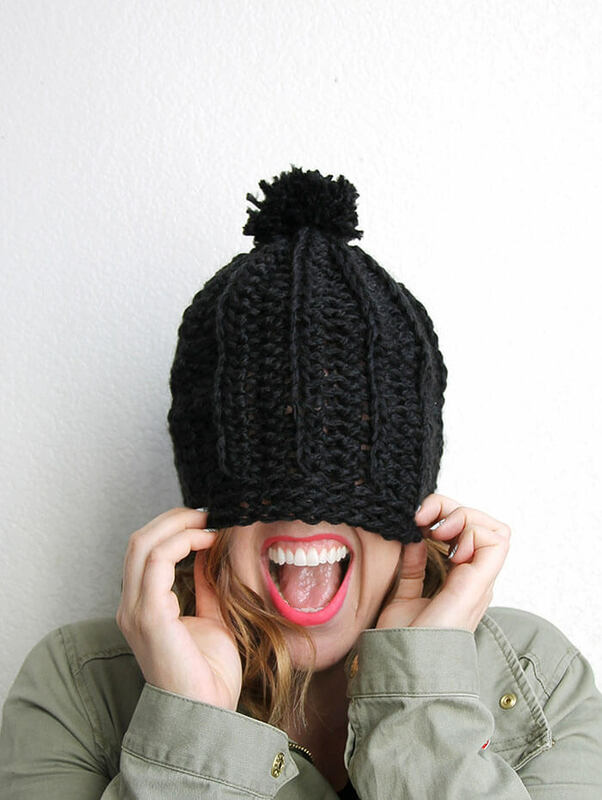 Crochet is next on my hit list now that I&#39;ve learned the basics of knitting. Maybe next year! This is just so beautiful I don&#39;t know what to say! This is SO going on my rather long &quot;to do list&quot; I think my house needs one of these. Don&#39;t give up on the knitting though, just knit small things as it&#39;s so much slower than crochet! 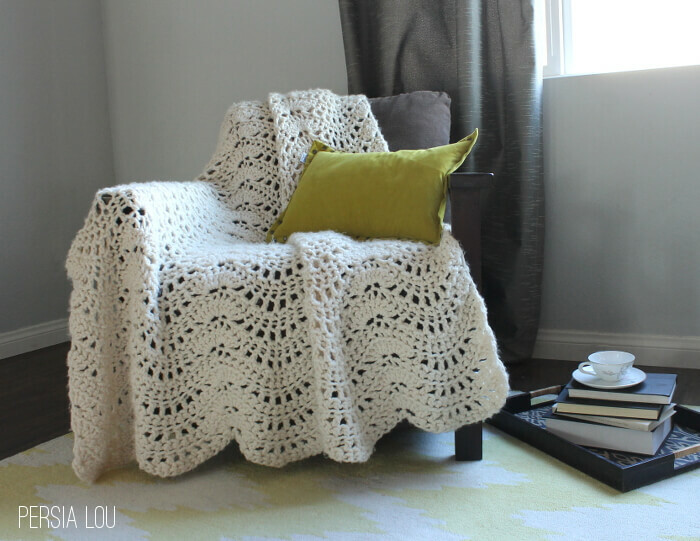 I found your blog from the Monday Funday link party ~ your afghan really caught my eye. It&#39;s gorgeous!!! I&#39;m sure your mom loves such a thoughtful and beautiful gift! It&#39;s beautiful! I&#39;m just a beginner myself. Working on a simple throw for the first time right now. But I can&#39;t wait to until I&#39;m improved to try to attempt this pattern. Right now, reading patterns is all just gibberish – LOL. Gorgeous Alexis! I love this pattern- the chunky look of it gives it such a cool modern edge but it still has that classic feel. 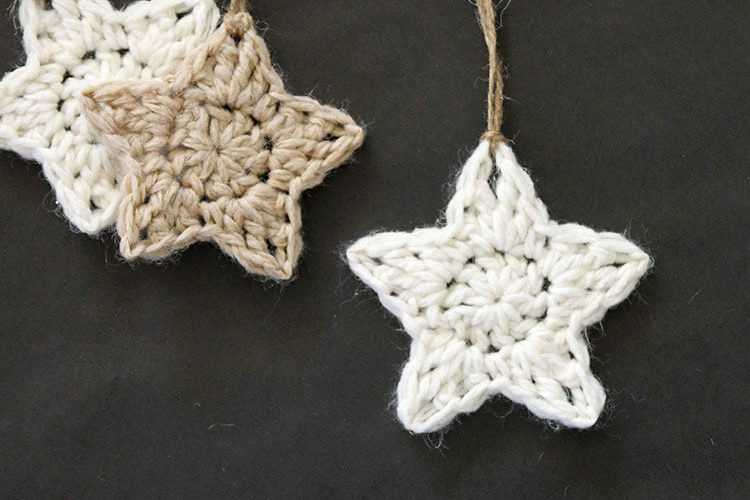 I taught myself to crochet last year using You Tube videos and have only made little baby gifts… but one day would love to tackle something like this- pinned! Love a chunky blanket. Lovely! I think it worked. I did the rest of the row, and now that you say that, I think that&#39;s what happened. If I keep going and it seems like it&#39;s not working, I&#39;ll be back! haha! This is a beautiful blanket! 🙂 Thank you so much! Haha…. yeah, honestly, I didn&#39;t even think about making a baby blanket for kid #3. I am pretty sure the blanket was on knitpicks, but it was a few years ago and when I just looked I couldn&#39;t find it. Sorry! Came across this on pinterest and I LOVE it. I decided to try it with the yarn I have, which is not at all bulky, and just use the biggest hook I have. It looks alright so far, but I definitely want to buy bulky yarn and a bigger hook. <br />Anywho, thanks for the free pattern! I prefer crochet too, but somethings look nicer to me knitted. I wanted to learn to knit continental style because it&#39;s faster, but always had trouble until I saw it on Youtube and figured out how that it&#39;s worked like crochet. You might check it out. Thank you for this pattern. LOVE this! 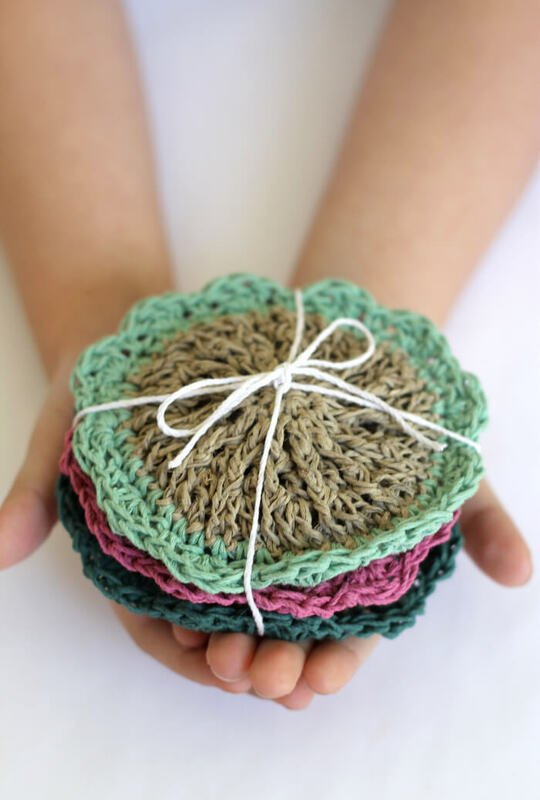 Thank you for posting…it looks like a giant doily sort of!! FUN! Hi Alexis. I love the blanket and I started it yesterday. I understand how the one side is straight but the other side isn&#39;t working out so well. Are both sides supposed to be straight? None of your pictures show it. Maybe I&#39;m doing something wrong. Hi Audrey! I&#39;m so sorry I didn&#39;t get back to you sooner. I missed your comment earlier. If you look at the last picture in the post, you can see the left side of the afghan (on the left side of the picture). That&#39;s what both sides look like. (Actually, you can see the bottom of the right side on that same picture.) The other two ends are scalloped. Hello! I&#39;m not sure if I responded to this question via email or not. I&#39;m sorry! I just added a chart to the post. I hope that will answer your question! If not, please let me know! Hiya! This is gorgeous and thanks for sharing the pattern. How long did it take you to make this? 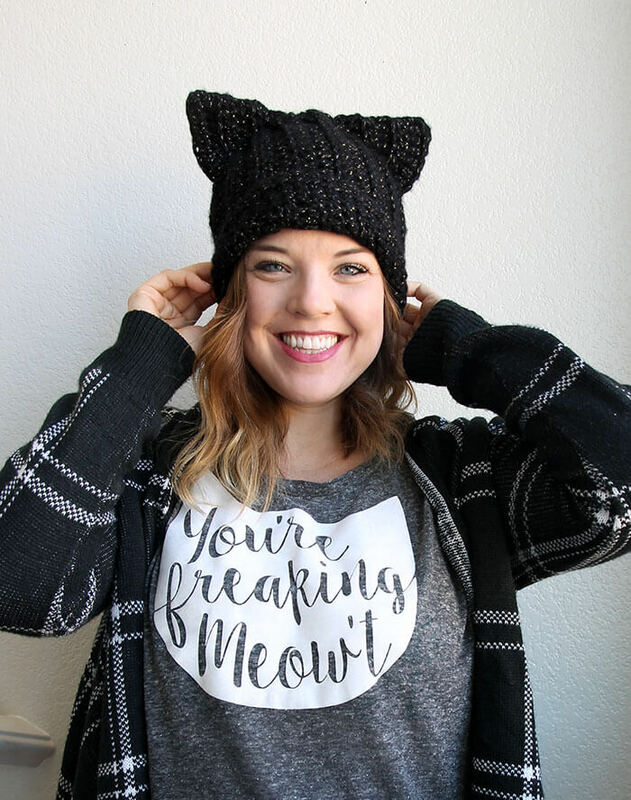 I&#39;m in need of a quickie gift for my bestie&#39;s 30th birthday… which is Sunday. Would an all night movie marathon crocheting fest get the job done? Thank you sooo much for sharing this! I&#39;ve been looking for a comfy, cozy, chunky blanket like this to make for myself and once I saw this I knew I had to make it. I&#39;m so glad I made it, it was exactly what i&#39;ve been wanting. Perfect!! Beautiful pattern, the chart really help, thanks. I will be adding this to my &quot;must do&quot; list! How wide (+/-) is the 5 pattern repeat? I like to make queen or king size as wedding gifts. I&#39;m dying to try this pattern out!! I&#39;m just wondering how different a bulky yarn would be instead of the super bulky. A 5 vs a 6 like what you used. Any idea how much that would change the pattern?? This is gorgeous, thank you so much for posting this!!! !